Reserve 4 Seasons Gatlinburg Today! Loved it! Beautiful and comfy! Love the seclusion! Everything was great except that the Trundle bed downstairs was broken and we could not use it. And the cabin needed more lighting and blankets/pillows. We loved the rustic look and thanks for letting us rent one night. Beautiful cabin at the top of the mountain. As others have mentioned a little steep and narrow drive leading to the entrance. After seeing other cabin views, I think we could have done better. Clean for the most part but some deeper cleaning was needed. 4pm check in with no flexibility is a little late. Very busy downtown area with lots of people and traffic. Next time a secluded cabin will be a must. Did see a bear off the deck was amazing. Would recommend some updates such as comforters and seating outside. Overall a beautiful cabin. There were bugs in the lower level and some of the bathrooms were not sanitized properly. Positives: Overall the cabin was VERY clean and did not feel old at all. I'm quite sure the bathrooms and kitchen have been recently updated. And the two "nooks" with windows made for amazing places to sit and enjoy the wooded views. The leather couch and lazy boys chairs were a favorite, so comfortable that we could (and did) easily fall asleep on them! The internet was fast, especially considering all four of us were using it at the same time. And we got very quick/friendly help from customer service when I called about our user name and password not working for the internet. They quickly gave us a new one! The cabin location was also very quiet with only one neighboring house, in part due to the fires. A short walk down the street let us know that at one time there WERE cabins that are no longer there. This cabin was so very fortunate to have been saved! And it was interesting to be able to see where the fires had been and the new growth that has started. Concerns: (1) The drive~ While I am quite certain this cabin is one of the HIGHEST on the mountain side, it also makes it very hard to get to. The driveway leading up to the house is marked with a "CabinsUSA" sign but no house number. And the steep driveway makes it impossible to see the house from the road. We took quite a few wrong turns before finding it. There were also 2-3 hairpin turns on our way up the mountain that required us to stop and back up before making the turn. Add narrow "one way" roads in a few places that required one car to pull off to the side while the other passed and it made the drive pretty tricky. While my boys certainly enjoyed the challenge, I would STRONGLY recommend that you NOT try to find this house in the DARK for your very first arrival! (2) The view~ You can see a mountain view from this cabin, which is wonderful, but the front porch off the kitchen and the driveway are the only locations where the mountain view is visible and even then it is partially obstructed by trees. Honestly, the best view (or best picture op) is from the master bedroom window upstairs if you hang your camera out the window! On a positive, in the evenings you are able to see the Pigeon Forge lights, the lit up Ferris wheel, and even Dollywood's fireworks in the far distance. You might enjoy having binoculars for this. (3) The trundle bedroom~ This particular bedroom is down in the basement while the other bedrooms are on the third floor. It was not an issue for our 24 year old son (although even HE joked that it was a bit creepy down there by himself) but a younger family might assume this is where they would put their smallest children to share the trundle beds. I just wanted to give you some heads up that this bedroom it is far removed from the rest of the house and does have an outside sliding door that leads out to the bottom level where the Jacuzzi is. I could easily see smaller children being scared to sleep down there by themselves. Plan for that possibility in advance. Things to remember: (1) Shampoo. But they do provide bar soap and plenty of towels. (2) A can opener. Thankful my husband had one on his pocket knife! (3) Porch chairs or camp chairs. There are not any chairs located on the balcony for your early morning coffee. (3) A sharp knife. There were plenty in the drawer, but if you are doing any real cooking you may want your own. it was difficult to chop my veggies.... I had to use more of a sawing action than chopping! LOL. (4) Bug spray... we forgot ours! And since we were there in mid-summer, the mosquitoes were pretty bad at night. (4) Coffee filters. We forgot these too! But I now know that paper towels will work as filters in a pinch! (5) Zip lock bags. Just ended up using these for several things as we packed for our daily adventures! Things they DID have that I wasn't positive before arriving: Coffee maker, toaster, bathroom towels, hand soap, dish soap, paper towels, plenty of cooking pots/pans/dishes, and iron. Great cabin. Great amenities. Love the game room downstairs. Hot tub is a great addition. Loved our stay. Beautiful location. Some of the turns up the mountain to the cabin are very tight. Queen bed in second bedroom creaks ALOT. Would be nice if this could be fixed. We would stay here again. Great place to spend time with family and relax. Also close enough to things to do in Gatlinburg and grocery stores. We rented Four Seasons for our honeymoon in June 1998. We returned to the cabin in 2008 for our 10th anniversary. Before we knew it, it was time for our 20th anniversary! We were so happy to be able to rent this cabin again. We felt like we never left and it made it all so real how quickly the years pass. We love this little place. It was sad and shocking to see that so many of the cabins right near this one had been destroyed in the fires. My heart aches for the Gatlinburg community. As usual, the cabin was clean & comfortable. The hot tub took several days to get up to temperature but when it did, it was so relaxing! We plan to return in June 2028 for our 30th anniversary. Thanks for a memorable vacation! Well, You did it again! 4 Seasons exceeded our expectations. The last time we stayed with you in 2016, it was just myself and my husband. We loved it so much, that we wanted to share it with our family. Absolutely gorgeous! Clean! and Comfortable. Just a couple wishes. Maybe basic things would be nice. Maybe like salt and pepper, sample shampoo and conditioner. (forgot to pack). And maybe some fold up chairs that can be kept inside at night, to sit on porch in the morning. These aren't complaints, just wishes and suggestions. I honestly couldn't express enough how much we enjoyed staying with you and that we definitely plan to come again. We had a wonderful time there after finding our cabin. It wasn't identified by number or name, but after many stops, including at our cabin twice, we finally found it. Someone had left a window open a crack and wasps had gotten in. We got rid of the wasps before we settled in for the night. The view was awesome from our cabin!!! This was our first time staying in a cabin and I would definitely enjoy staying in another one. The staff we talked to were very professional and friendly. Our daughter and grandson joined us there and there was plenty of room for all and the little one really liked the game room! We had a great spring break week at this cabin. We even saw a bear come up at night...he was huge. The morning we left it looked like he rampaged a few dumpsters from nearby cabins and ours too. The cabin was very relaxing, only complaint is the door and bed in the second bedroom upstairs, too noisy. The jacuzzi in the master bedroom could also use some privacy curtains. The surrounding area has a lot of things to do and everything is within a 10 minute drive. The drive up to the cabin was nice, but the road is a little tight so watchout for other vehicles...it's a 2 way and there are no rails on the side. There was no snow so we didnt need a 4x4, our van drove up just fine. We loved it. Trash gets picked up on request..just shoot them an email. There is no gas grill, it's a charcoal grill. Overall great stay. Thanks! We enjoyed a relaxing stay at 4 seasons. The cabin is very nice and I am glad the wild fires didn't get to this one. The turn to get up to it is a little tricky but other than that the drive is easy. We really enjoyed the hot tub and pool table. We also liked the king bed and pillows better than the ones we have at home. Check in is easy but would be really nice if you didn't have to check in at the office and could go straight to the cabin. All though the ladies at the office are always very nice. Upon arrival we discovered there was not a grill or fire wood. I called the office and she said the fire wood was our responsibility and let me know where we could purchase some. We were close to town so we just picked some up. She also sent someone with a charcoal grill so we were still able to cook out as planned. Would have been nice if there were some chairs so we could sit outside but other than that we had everything else we needed. I would recommend CabinsUSA and will use them in the future. We came down for a Family Christmas Getaway and stayed in 4 Seasons Gatlinburg. The cabin itself is absolutely beautiful, and it was perfect for us. It was very clean, and very comfortable. There are a few things we would change if we could, however. There is an open window that leads from the master bedroom/bathroom straight out into the stairway, which makes it not very private. I was soaking in the tub and was able to hear everything the teenagers were doing downstairs in the livingroom. This may be good in some instances, but it just did not provide for any privacy. If the owners would just enclose this, it would be perfect! The only other drawback was the 3rd bedroom. I would recommend instead of putting a twin with a trundle in there, I would put a set of bunk beds. The boys were constantly having to step over each other to get to the bathroom. Other than these two things (we didn't even mind the crazy windy road up to the cabin), it was perfect! We visit Gatlinburg numerous times per year, and will more than likely be staying again! Thanks for the memories at 4 Seasons Gatlinburg! No bowls, wine glasses, or wine bottle opener. Needs dusted. Beautiful place! This was our first stay in a cabin in gatlinburg and we loved it!! The cabin looked just like the pictures and the view was beautiful! The staff was very pleasant and helpful every time I called with a question! If I were to change anything (and this still isn't a complaint), the large windows give you a gorgeous view of the mountains and surrounding area, but there are no shades or blinds. Would have been nice to have the option to shade the room. But again, not complaining, because we enjoyed our stay!! We booked a cabin for next year before we even checked out! This Cabin was Awesome, Love The View and it was so quiet, Perfect Spot. It was plenty of room for my Family of 8, while we there we had Bears come up after the trash and we got some pictures of them. We had such a Great Time, I would Highly Recommend This Cabin... We Loved It!! Was a great cabin with really fast internet if your concerned about that it was 50-70mbs! The only complaint is the road to get up to cabin is narrow curvy road straight up and the cabin is at the top of mountain and we drive a Dodge Journey and would have to back up after turning to make the one curve it’s that tight! Besides that we loved the view and cabin would stay there again long as it’s not snowing! It needs some rocking chairs on the front porch. For the most part it was clean but some of the windows looked like they haven’t been cleaned in awhile and some cobwebs were found through the house. Beautiful well maintained cabin minutes from downtown Gatlinburg. Large bedrooms and fantastic kitchen. I am so happy to hear that you enjoyed your stay in 4 Seasons Gatlinburg! We here at Cabins USA strive to give each of our guests the best stay possible while vacationing in the Smokies. When you are ready to stay with us again, please mention you are a return guest for an additional discount. Thank you again for your review and thank you for choosing Cabins USA! Thank you for all of your kind words! We here at Cabins USA work hard to make sure each of our guests have the same great stay you enjoyed while vacationing in Smokies. When you are ready to stay with us again, please mention you are a return guest for an additional discount. Thank you for choosing Cabins USA and we look forward to seeing you again soon! On the last night we were there bears opened the garbage box and pulled out the cans and all the trash was all over the driveway the next morning. The garbage company had not been there all week. The garbage container had no lock or way to secure it. (if that would have helped) Ha Ha. I know when I'm hungry nothing can stop me from getting in to the fridge. Anyway we cleaned everything up and we have been renting cabins for 30 years in Gatlinburg and Pidgeon Forge and this was the cleanest with the most beautiful view we've had. Thanks John and Patti Ledford. Thank you for taking the time to let us know about your recent stay in 4 Seasons Gatlinburg! We strive to give each the guest the same great stay you experienced while vacationing in the Smokies. Thank you for choosing Cabins USA and we look forward to having you as our guest again! Our family had a great time. Only issue was seating outside on the balcony, we brought our own fold out chairs but would have been nice with a little patio set. Overall it was very nice, thank you for making our stay a great one. Thank you for taking the time to let us know about your recent stay in 4 Seasons Gatlinburg! We here at Cabins USA work hard to make sure each of our guests have the best stay possible while vacationing in the Smokies. When you are ready to stay with us again, please mention you are a return guest for an additional discount. Thank you again for your review and thank you for choosing Cabins USA! 4 Seasons Gatlinburg was a great cabin to stay at. It was a beautiful cabin with all that was needed to have a great stay. (The only thing we were missing were the logs for the fireplace, but no big deal as we were able to buy at the local Publix in Pigeon Forge). The view from everywhere in the cabin was spectacular. My only comments - the drive up to the cabin was very tricky (be prepared) and if you want to hang clothes in the closet, bring hangers. I would very much both recommend Cabins USA and in particular this cabin. Loved the location, the cabin is really nice and clean. Nice to see that the wild fires somehow spared this one!.. The only bad thing I noticed, is with such great views of Pigeon Forge and the mountains the windows could have been cleaner to enjoy them. Other than that we had a great time here and would consider this cabin for future stays. Thank you for all your kind words! We here at Cabins USA work hard to make sure each of our guests have the best possible stay while vacationing in the Smokies. When you are ready to stay with us again, please mention you are a return guest for an additional discount. Thank you again for your review and thank you for choosing Cabins USA! I was well pleased with the reservation process. The express check-in and check-out was fast and simple. The drive up to the cabin was very tricky especially since we have a F350 dually truck. There was a couple of curves that were so sharp that we had to back up and pull ahead a couple of times. When we first arrived at the cabin, we turned on the tv but the cable didn't work. After a quick call to the office, we were informed that the cable was out. It was understandable considering the recent wildfire. We just made a trip by Walmart the next day for a few movies. The view from the cabin was breathtaking but there wasn't any chairs to sit in on the porch which is the main reason we rent a cabin. We will more than likely use CabinsUSA again but doubtful that we will stay in 4Seasons Gatlinburg due to difficulty in getting our big truck up to it. Thank you for all of your kind words! We here at Cabins USA work hard to make sure each of our guests have the best stay possible when vacationing in the Smokies. When you are ready to stay with us again, please mention you are a return guest for an additional discount. Thank you for choosing Cabins USA and we look forward to having you as our guest again soon! We had no tv the whole time of our stay..really did not matter much...we found that we talked more..they sent somebody right over. But it was not the tv..or equipment the service was down..we never called back to complain because it was fine..we thought they needed bigger bowls..and that is about the end of it.Id tell my friends to come for sure. The cabin was very spacious; our only complaint was that the 3rd bedroom was very far from the main level, and the other 2 bedrooms are on the second level. With younger children, you may not feel comfortable leaving them this far down in a basement when you are on the top floor. Also, the 3rd bedroom is essentially a laundry room that they jam packed 2 twin mattresses in. The staff at cabins Usa were all very friendly. Courtney helped us book our room and even helped us with checking in. She was very friendly and went out of her way to make sure we had a nice stay. :-) the cabin was very clean and even smelled like fresh mopping solution when we walked in. Overall, it is a nice cabin, but I would reccomend it for 4 people and not 6. Thank you for taking the time to let us know about your recent stay in 4 Seasons Gatlinburg. We here at Cabins USA work hard to make sure each of our guests have the best stay possible while vacationing in the Smokies. Thank you for letting us know about the sleeping arrangements in the cabin. Your comments have been forwarded to our reservations department so we can make other guests aware. When you are ready to stay with us again, please mention you are a return guest for an additional discount. Thank you again for your review and thank you for choosing Cabins USA! My family and I had a phenomenal time at the 4 seasons cabin. It was very clean and the beds were super comfortable. It is in a great location. Just slightly private but close to everythig as well. Great views. The trip up to the cabin is just a little tricky but not bad at all. Check in was easy and the staff was great. We will definitely rent from cabins usa and this cabin again. Thank you for all of your kind words! We here at Cabins USA work hard to make sure each of our guests have the same phenomenal stay you enjoyed while vacationing in the Smokies. When you are ready to stay with us again, please mention you are a return guest for an additional discount. Thank you for choosing Cabins USA and we look forward to seeing you again soon! This was the second year that we rented 4-Seasons. Overall, a very positive experience. The interior remodeling and upkeep has a very sophisticated and luxurious feel. We will continue to rent this property! Thank you for taking the time to let us know about your recent stay in 4 Seasons Gatlinburg. We here at Cabins USA work hard to make sure each of our guests have the same great stay you experienced. I apologize for lack of seating outside. Your comments have been forwarded to our Owner Liaisons to be addressed. Thank you for continuing to choosing Cabins USA and we look forward to having you as our guest again! Loved this place!! Was out home away from home. Had everything you could possibly think of. It was just the way online presented it to be and more! 4 seasons gatlinburg is now our annual summer spot!! Location was great, though a little scary driving up to the mountains but it was worth every dime and second! This is the second year in a row we've stayed at this property. Our family loves staying there. Thank you for continuing to choose Cabins USA when you vacation in the Smokies! We work hard to make sure each of our guests have the best stay possible. Thank you again for choosing Cabins USA and we look forward to seeing you again soon! Overall, we had a good time during our stay in this cabin. The kitchen, living room, sun room, and bedrooms were very nice. The master bathroom whirlpool tub was enormous and very comfortable. We enjoyed the game room in the basement. A few things came up and we called Cabins USA three times. The internet wasn't working and we opened a window and then it would not close. Both issues were resolved. The grill at the cabin had completely rotted through the bottom and was unusable. A new charcoal grill was brought to the cabin the next day. This cabin has wood burning fire places and the cabin has a strong smoke smell. This was irritating my wife's asthma. One suggestion for the cabin company/property owner - the sign for the cabin was laying on the ground and we had a hard time finding the cabin. Also, make a change on Cabins USA website for this cabin. The photos and description state it is a gas grill, but it is a charcoal grill. When the new grill arrived, we were expecting a gas grill and were unprepared for grilling with charcoal. Thank you for taking the time to let us know about your recent stay in 4 Seasons Gatlinburg. We here at Cabins USA work hard to make sure each of our guests have the best stay possible while vacationing in the Smokies. Thank you for letting us know about the sign and grill. Your comments have been forwarded to our Owner Liaisons to be addressed. When you are ready to stay with us again, please mention you are a return guest for an additional discount. Thank you for choosing Cabins USA and we look forward to having you as our guest again! First time to the cabins and I must say I enjoyed myself despite the minor little hiccups. Let's get into the minor stuff first 1. Power wasn't turned on when we first arrived 2. Little dusty for me not sure when someone was last there, but couldn't be that long ago. 3. Bathrooms weren't so cleaned had to clean again shower doors were dirty and toilet seats weren't cleaned like they should be. 4. Got lost because I guess GPS doesn't pinpoint exact location in the mountain. 5. Misplaced wedding band called several times and no one responded back to me to see if it was found. 6. Last thing Windows did not open and we really wanted to let the fresh air in. Overall I give my stay an 8 because of the minor details. I would definitely recommend cabinsUSA again and yes, I would stay at the 4 seasons again with couples not kids. Lol!! Also, the road up the mountain wasn't to bad glad it didn't rain and was amazed how close we were to pigeon forge and downtown Gatlingburg. I definitely didn't feel stress(Im a city girl) and love the views and the walks in the mountains. Loved how the cabin was updated and provided all of your cooking needs. I would suggest a bigger table like the high one that sits 8, table could only seat 4 and that was disappointing. Had a few teenagers w/ me and they really enjoyed it. Thank you for taking the time to let us know about your recent stay in 4 Seasons Gatlinburg. We here at Cabins USA work hard to make sure each of our guests have the same great stay you enjoyed while vacationing in the Smokies. Thank you for letting us know about the issues you experienced during your stay. Your comments have been forwarded to our maintenance department as well as our housekeeping department so they can be addressed. Thank you again for your review and thank you for choosing Cabins USA! Me and my family had a great time , the price were worth it . I had my 39th birthday party there with my family , I don't think I could have picked another place for it . Only thing were going up the steap road to the cabins , by me being from the city were scary . Only thing need to be told up front but don't think, that would have changed my mind at all . I am so happy to hear that you enjoyed your stay in 4 Seasons Gatlinburg! We here at Cabins USA work hard to make sure each of our guests have the best stay possible while vacationing in the Smokies. When you are ready to stay with us again, please mention you are a return guest for an additional discount. Thank you for choosing Cabins USA and we look forward to having you as our guest again! First off let me state that we were very pleased with our cabin and it has been one of the nicer places we stayed. Booking with CabinsUSA was flawless and convenient without ever having to even stop at the office to check in or out. The cabin was very nice and pretty much as advertised. 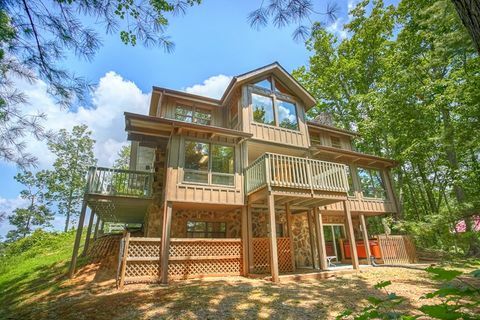 The location was ideal between Pigeon Forge and Gatlinburg, had excellent views and rather private with a beautiful setting. The slight ding on the location was based on the drive up the mountain, this is not for the faint of heart if you are from the flatlands such as we are (from Ohio). Steep hills, narrow roads, no lines or lights at night. This is to be expected but this cabin is at the very top and you may prefer a cabin with an easier drive if you are afraid of heights. We were a little early arriving and the cleaning crew arrived slightly after us but took a little longer than the promised time to check in to finish cleaning. They were very nice and did a good job cleaning the cabin from the previous occupants. They did actually change the code when we arrived and that gave us some piece of mind about the security of the unit. We have rented many homes and apartments over the years and were very happy with this rental but would recommend the following changes to get a perfect score. There are three fireplaces and firewood was plentiful; however, as a previous renter commented, there was no kindling and in our case no matches. We were not upset but slightly inconvenienced and bought some duraflame logs to start the wood and a couple of lighters, which we left for the next renters. We also bought some chalk for the pool table and left that as well. I think the biggest inconvenience was the grill. The photos indicated a gas grill was there but a dilapidated charcoal grill was all that was available with no charcoal. We are pretty easy going and just bought a cheap propane grill at Lowes ($30.00) and cook a few steaks on that instead. One of the fire alarms was beeping and while we took out the 9 volt battery to stop it there were no extras for replacement. We are also used to seeing some small items like salt and pepper (which we bought and left) and maybe some coffee. I realize that maybe not all renters are ideal and may have taken these items so it is not fair to assume they have never been provided. Like I said, we would highly recommend this property and do not want to give the impression we were unhappy but just wanted to indicate what would have given this cabin a perfect score. Thank you for taking the time to let us know about your recent stay in 4 Seasons Gatlinburg and I am so happy to hear that you enjoyed your stay! We work hard to make sure that each of our guests have the same great stay you enjoyed while vacationing in the Smokies. Thank you for all of your suggestions; we are always looking for ways to improve our guest's experience. When you are ready to stay with us again, please mention you are a return guest for an additional discount. Thank you again for your review and thank you for choosing Cabins USA! Cabin was nice but coming from Canada (and paying .35 cents exchange on the dollar) we shouldn't have to bring basic supplies .No hangers or hooks anywhere.REALY!Your imagery shows nice deck chairs,would have been nice to of had some to SIT and RELAX or read a book on our vacation.Nice fireplaces to enjoy on a chilly,(Sunday night and all day Monday) rainy day but would have been nice to have a little dry firewood and kindling,or an axe .We know the cabin has basic supplies but with being a 3 B.R. for 6 people maybe more than 1 cereal/breakfast bowl etc. Overall perhaps a walk-through and inventory tweaking would take this cabin from good to GREAT. We loved our stay at the 4 Seasins. The house was great and the views amazing. Would not hesitate to go back. We stayed in this same chalet 25 years ago for our honeymoon so we were very excited about staying here again to celebrate our 25th anniversary. I am so happy to hear that everyone enjoyed their stay in 4 Seasons Gatlinburg! We here at Cabins USA work hard to make sure that each of our guests have the same peaceful stay you enjoyed while visiting the Smokies. When you are ready to stay with us again, please let our reservationists know you are a return guest for an additional discount. Thank you again for your review and we look forward to having you as our guest again! Loved staying at the cabin, only thing we were unable to use was the wifi. Pages were not able to load no matter what we tried. The dryer stopped working after 10 minutes, it was overheating and cutting off. Hope everything will be corrected on this issues. We would like to visit again. Upon arriving at the cabin to check in the maintenance man was still at the cabin st 3:40 pm we were supposed to check in at 3:00 he said he was fixing the hot tub. The hot tub would never go down in temp it stayed at 104 which was very uncomfortable after about 10 mins.The cabin smelled really musty like it hadn't had a very good cleaning. The upstairs bathtub didn't have hot water and there was no privacy to be able to use the jacuzzi as on 1 side you have huge windows looking straight across to the neighboring cabin and the opposite side there is a huge opening in the wall showing the top of the staircase. We felt that we didn't get to enjoy the full extent of the cabin. Only thing was the view because the trees was too high in the back to enjoy. The wonderful view but other than that it was wonderful. Thank you for choosing Cabins USA Gatlinburg. We are so happy to see that you enjoyed your stay in 4 Seasons Gatlinburg. We hope that you will stay with us again soon. we really enjoyed our stay at 4 Seasons. The only grip is most of the tv's are really old. They need to update their tv's. A wonderful property. We like being high up on the mountain, so the location was great for us. We now know that we prefer a bed room on the main level so my grandmother doesnt have to worry about the stairs. The game room trundle bed room could have been a bit more clean underneath the bed and the sheets werent on the bed just folded up beneath the top blanket. The rest of the house was spotless and very nice. The master bedroom at the top was very wonderful and roomy. The only other thing that needed fixing was that the stand up shower pipes leaked onto the main level at the foot of the staires. But i believe the company was working to fix that problem. All around good place to stay. We will most def. be using Cabins USA again. Had a very nice time! Cabin was nice! Thank you for choosing Cabins USA Gatlinburg. We are happy to see that you enjoyed your stay in 4 Seasons Gatlinburg. We hope to see you again soon.